Pasture land where invasive plants were removed (fire and herbicide). 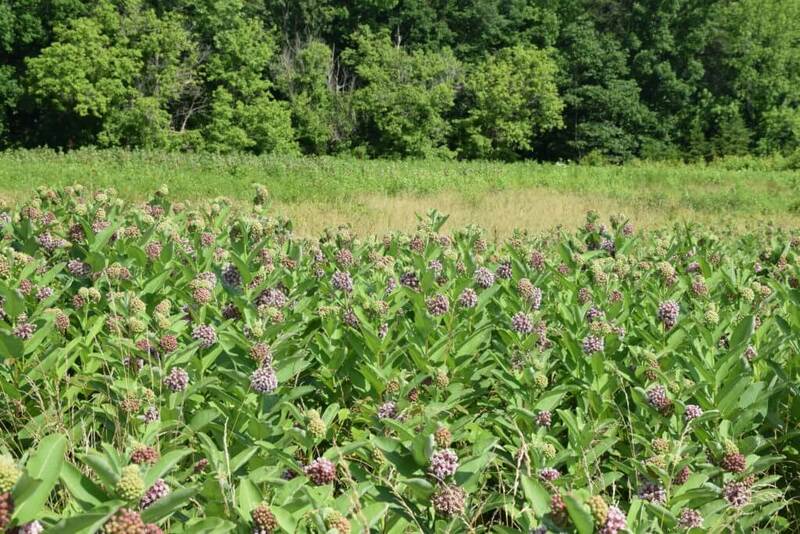 Common milkweed stand grew from the dormant seeds in the seedbed. Field managed by NC Wildlife Resources Commission. Did you know that seeds can survive in soil for 20-30 or more years? Before spending money on seeds, consider letting an area go back to nature and see what might grow up out of the seed bed. Areas with trees or invasive plants may need to be cleared first. A prescribed fire burn could be just what a field needs to get growing again! North Carolina Wildlife Federation is pleased to offer technical guidance and assistance to members in order to best assist landowners with meeting conservation objectives. If you would like assistance with a large scale pollinator habitat restoration project, please contact Angel Hjarding, Director, Pollinator and Wildlife Habitat Projects. Watch this video to learn how a rancher and his wife turned a pasture into a perfect monarch habitat!